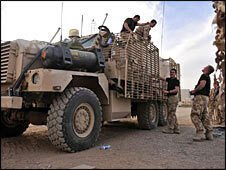 Scientists from the UK Ministry of Defence (MoD) have devised an ultra-hard vehicle armour to protect military personnel. Details of the steel armour, called Super Bainite, were outlined during a seminar at the University of Cambridge. Unexpectedly, the MoD team has given the armour a protective advantage by introducing holes into it. According to scientist Professor Peter Brown, these perforations help deflect incoming projectiles. "I wouldn't like to have been the first person to have suggested that," said Professor Brown, from the Defence Science and Technology Laboratory (DSTL) at Porton Down in Wiltshire. He explained: "You shouldn't think of them as holes, you should think of them as edges. When a bullet hits an edge, it gets deflected, and turns from a sharp projectile into a blunt fragment - which is much easier to stop. It doubles the ballistic performance and halves the weight." The armour plates have performed well in ballistic testing at the Ministry of Defence's firing ranges. Certain heat treatments alter the fine-scale structure of steel, creating a "phase" called bainite - which has been known about since the 1930s. But a new manufacturing process, developed by DSTL scientists in collaboration with steelmaker Corus, allows the alloy to be produced quickly and cost effectively. Super Bainite develops its exceptional strength through a new low-temperature process called "isothermal hardening". The steel is heated to 1,000C, cooled to about 200C and then held at this temperature for a period of time before cooling to room temperature. Initially, the team held the steel at about 200C for just over two weeks to achieve the right ballistic protection. However, this was too slow for the process to be commercialised. The researchers subsequently reduced the heat treatment time to eight hours by transforming the steel at 250C instead of 200C. Importantly, the work gives the UK an indigenous armour steel manufacturing capability, benefiting industry. Professor Brown also gave details of other current materials research with potential applications in armour. An industrial process called "Kolsterising" (developed by the firm Bodycote) is able to increase the surface hardness of stainless steel to twice that of Super Bainite while maintaining its ductility - the extent to which a material can be bent, or deformed, without fracturing. "It's as hard as a ceramic and as ductile as a metal. It re-defines, really, what steel is capable of," he said. Professor Brown was speaking at the recent Horizon seminar held at the University of Cambridge.